Destroy Molag Bal's Great Shackle. The Great Shackle — Destroy the Great Shackle and end the Planemeld. I restored Vanus Galerion and disrupted activities at the Black Forge. Now we need to assault the Great Shackle and end the threat of the Planemeld once and for all. Find the Great Shackle's power source. Reverse the energy flow in the magicka conduits. (Optional) Along the way, save Sage Tirora and Treva and they will help you later on. Return to the Hollow City. Enter the Mages Guild District. 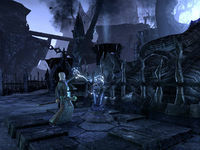 After completing this quest, the Mages Guild hall in The Hollow City will unlock, and Vanus and most of the other Guild members in Coldharbour will be found there. Vanus will open a portal to take you directly to the hall if you wish. I should talk to Vanus Galerion when I'm ready to head for the Great Shackle. I should follow Vanus Galerion into the Great Shackle. Vanus used the door and entered the Great Shackle. I should go inside and meet up with him. Vanus and I need to look around and find the main mechanism powering the Great Shackle before we can attempt to destroy it and end the Planemeld. I unlocked to way to the Mooring. Vanus and I need to go there to destroy the Great Shackle. I need to protect Vanus Galerion while he casts the spells to weaken the Great Shackle. protected Vanus Galerion while he weakened the Great Shackle. I should watch the Shackle fall. The Great Shackle is destroyed! But Cadwell informed us that the threat of the Planemeld isn't over yet. I should follow Vanus through the portal to the Hollow City. We destroyed the Great Shackle, but Cadwell claims the Planemeld hasn't been completely defeated yet. I should talk to Vanus Galerion and see what he thinks about the situation. This page was last modified on 8 August 2018, at 18:55.